1-1/8", 9A, Reciprocating Saw With Swivel Grip For Scrolling Cuts, Rafter Hook, Soft Grip On The Handle, Lockjaw Blade Change For Simple Blade Insertion & Ejection. The RS5 is one of only 3 recips with a comfortable fore-grip (the others are the Ryobi and Ridgid). Most recips have a big hump or step at the fore-grip so they are awkward and uncomfortable. The RS5 is one of the lighter recips at 7.2 lbs. The swiveling fore-grip piece is nice and unique. Now the bad news. Power is average. Vibration is average or slightly worse. The foot is not adjustable and sticks out too far. The blade release twist-button cannot be operated with gloves, so you have to fiddle around the hot area with bare fingers. Ouch! The cord is short. The trigger-operated speed control is nearly useless (the proper way to do it is with a separate dial like the Ryobi). For infrequent use, almost any recip will do. For extended or pro use, there really isn't a perfect one. I tried them all. Comfort ranks high for me as a builder (it also makes it safer, as in good grip and not tired). So I will probably keep the RS5 for everyday comfort and the Milwaukee 6521 for occasional heavy-duty use. I wanted a mid-priced, quality saw with variable speed control. The Bosch RS5 won my vote. The price point was good, solid name, and the right features. It's not the lightest saw out there by any means, but it's got plenty of power and good grips. I've used it on two projects so far and have had no issues. Bought this saw to replace an older model Craftsman sawsall with the allen key blade clamp. I would have to say that one of the best features of the Bosch saw is the blade clamp, just turn clockwise and pop in a blade and the spring loaded clamp locks onto it. No more allen wrench! The saw also features a pivoting shoe and a powerful 9 amp motor along with a nice case with a blade storage compartment. I would rate it 5 stars, but I will rate it a 4 due to the rotating scroll collar. While operating the saw, I noticed the scroll lock button unlocks itself and the collar rotates when I don't want it to. 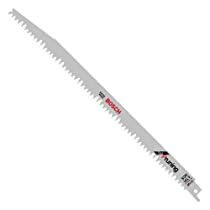 Except for that it is a great saw that is easy to use and has alot of nice features. I would recommend it.